Lunch is a good thing, and to me is much more than just about the food. It is a great excuse to take an extended and always well deserved break while refueling with good food. Lunch is my ‘me-time’, a mini vacation treat I give to myself, and at work or home, that is very important. I believe very much in making full use of the lunch break, but it is so often a neglected meal. If it’s not skipped altogether, it is either rushed or reduced to a series of unimpressive, forgettable, makeshift meals. Chronic lunch skipping is a self-sacrificing act which most often happens in the work setting. The results are often detrimental and can be described in one phrase-‘Dazed and Not-All-There”. Some symptoms of lunch deprivation: irritability, poor judgment, a zombie-like appearance, sluggishness, decreased focus and concentration, and the very obvious ‘roaring lion’ stomach noises which come at the least ideal time. That certainly doesn’t describe someone who is working at their best. -Employees can ask whether co-workers would like to order take-out from a good restaurant close by and enjoy lunch together. -Bosses can use some of the company’s petty cash to order lunch for their immediate staff. This is also an inexpensive way to boost employee morale by making people feel appreciated, which is great for the company on a whole. -As much as possible, try to be out of your physical work space at lunch time, preferably outside the building. If you can’t do this, then perhaps you could find an unused conference room or eat in the company lounge if you have one. -If your lunch table must be at your office desk then make that space pleasant. You are spending the better part of your daylight hours in this place, so why not make it personal and pleasing. Have pictures and items that make you happy and bring good memories. In the long run, a hurried, gobbled down "quick bit" or no lunch or even worse, one of those high sugar, high caffeine energy drinks in the can or bottle, negatively impacts overall health and reduces positive experiences with food and eating. So lunch it up at work and at home! 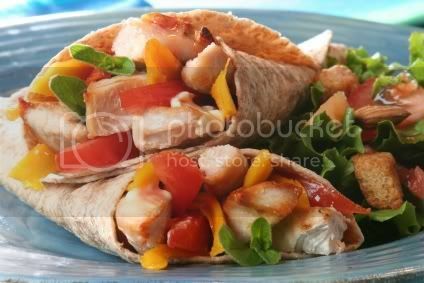 Are these wraps or pitas? Which ever they are, they sure look good. Beautiful picture. Thank you so much for your comment and for visiting. I'm interested in taking a look at your online jewelry store. Could you give me the url? Have a great day and good luck with your sites Karen. Lunch is the most important meal of the day. I work from hme so have a proper cooked lunch everyday-I consider myself very fortunate.